How is tooth crystal attached? It is attached to the surface of tooth that you request with special adhesives by your dentist without abrasion. Does tooth crystal fall off over time? Attached to tooth surface, it has a possibility of falling off due to pressure of excessive biting motions; but, tooth gem’s falling off does no harm to your teeth. Tooth gem that is attached at our clinic has a lifelong warranty. If it falls off, it will be attached free of charge. How is tooth diamond attached? Tooth diamond is a natural stone and its surface that is attached is pointed. In order to adapt this pointed surface to the tooth, tooth surface is abraded in the amount of it. Special adhesive is applied between the tooth and diamond. Does tooth diamond fall off? Because it is attached to tooth surface after abrasion, it is resistant to biting motions. Can tooth crystal/tooth diamond be removed if I want? Tooth crystal can be removed in any time you want. Your tooth regains its original look after it is polished. Does tooth crystal harm my tooth? Due to the fact that it is attached only to tooth surface, it does no harm to tooth. Can I attach tooth crystal on my own? Why should I go to the dentist? In addition, there are tooth crystals which you can attach on your own on the market. Yet, the components of the adhesives are not the same as those of your dentist. 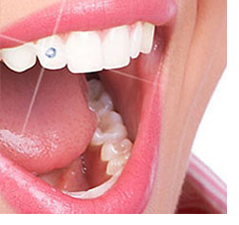 In this case, it is possible for the crystals to fall off, cause permanent discoloration and harm your teeth. When you attach them, overflowing adhesives create an unpolished surface and cause discoloration due to plaque accumulation. While providing you with esthetics, your dentist does it with a healthy method that you can back out in any time. Does tooth crystal cause discomfort under my lips? Its surface is smooth. I does not cause discomfort under your lips. Does its color change over time? It does not require special care other than daily oral care.